Yep, another shirt....and I've got a stack of custom-designed shirt orders left to to fill. I'll have to make this post a quick one so I can get back to machines. But before I start the next client shirt, DH Roger wants one made from this fabric..and that's fine with me. He deserves it, this fabric was a joy to work with....and I want to try out some new design detail ideas! SEWING and DESIGN NOTES-- This semi-fitted shirt features grosgrain ribbon details on the right front button band, pockets, and sleeve plackets. The outer collar and its stand, and the outer cuffs are interfaced with ProWoven Shirt Crisp Fusible, a professional grade Interfacing found exclusively at Fashion Sewing Supply , as are the buttons (from the "Dark Assorted Shirt Buttons By-the-Scoop"). The trim is from my personal stash...source unknown. The fabric is an amazingly lovely, finely woven soft chambray from Gorgeous Fabrics where I have purchased many wonderful shirting fabrics over the years. Seriously, this "Blue Belle Chambray" Shirting fabric practically sews itself! 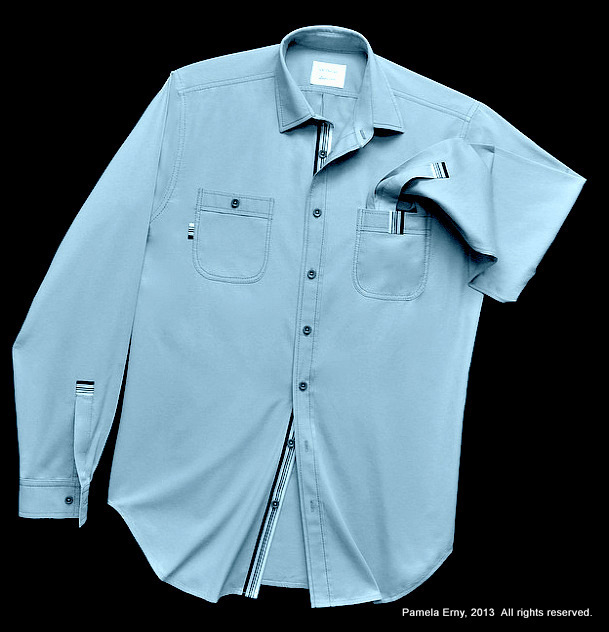 And the ProWoven Shirt-Crisp Interfacing from FSS complemented it perfectly for this menswear shirt style. If using this fabric for a garment for myself, I would have opted to use ProWoven Light-Crisp Interfacing or ProSheer Elegance MEDIUM Interfacing (all interfacing styles from FSS). The shirt is beautiful, especially with the grosgrain detail. A nice touch! More genius in custom shirting inspiration. Pam, you are the best! No one does elegant little details on men's shirts quite like you do - another fabulous winner! Love those details. You are so creative with those little bits! Stunning! Never thought I'd say that about menswear - but this shirt deserves the accolade! Pretty much what everyone else said above me. I LOVE it!! Love your shirts. I've just started making these for DH so I'll be using your posts as reference - if that's ok with you? Did you apply the grosgrain to the top of the sleeve placket before or after you sewed the placket? Am trying to mentally calculate which would be harder to accomplish, and/or take more time. Really like the detailing on this shirt. Subtle but classy! I have a LITTLE dressmaking experience and I have decided that I must make my man a shirt as he can't find anything that fits in any high street store (never has been able to) and it makes him very frustrated and and sad. He isn't a 'standard shape' and so is not catered for. He has a very broad chest - 51-52 inches and this would mean buying xxxl shirts here in the UK. The problem is that these shirts come with a xxxl waist measurement and my man's is a relatively slim 41 inch. If he finds a shirt to fit his chest (only via mail order in his size) he looks like he is wearing a tent, making him look a lot bigger than he is. He is currently getting by squeezing in to xxl shirts from one store that only just about fit (as long as he doesn't breathe out). He has never had a shirt that fits properly, he hates trying on clothes because it makes him feel like a freak. It would make him very happy if I could make him a stylish shirt (he is 36 years old) with a bespoke fit.